What a weekend I had! Unfortunately, I didn't officially work out, but I did get to exercise some new muscles, which I'll explain later. This weekend was one of the best that I can remember, and definitely is the highlight of my summer. To start off, on Friday after work, all of the PNC interns were invited to the Pirates/Cubs game. 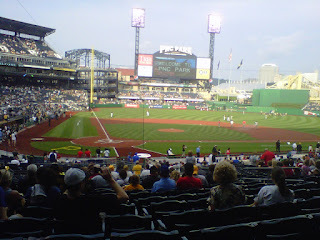 I am a HUGE sports fan, especially of Pittsburgh teams, so I was really excited to go. This year I've already been to over ten games, so it's been a really special summer getting to see the Pirates doing so well. We had incredible seats (picture below) a few rows directly behind home plate. It was such a great game, and we ended up winning with Mike McKenry's first major-league home run. What an exciting, amazing game! On top of that, McCutchen and Correia got named to the All-Star team, and the Pirates won the series. Overall, a terrific weekend to be a Pittsburgher. On Saturday, two of my friends from college, Chris and Rob, came to visit and we went white-water rafting at Ohiopyle. This was one of the most incredible things that I've ever done! It was a physical workout, constantly battling the waters and paddling. It was also such a gorgeous place. Unfortunately, we couldn't take cameras because they would get destroyed, but you can just imagine being surrounded by trees and mountains, drifting along a wide river covered in rocks and rapids. It was an unforgettable experience, and I can't wait to go back to try harder rapids! We were also able to walk around the beaches and soak up the sun for a few hours. It was an absolute perfect day to be there (mid 80's and mostly sunny). After all of that excitement, I slept in on Sunday (which was WONDERFUL) and tried to recover from the trip. I was, and still am, covered in bruises just about from head to toe, as well as scratches and cuts. My arms and legs are also really sore from using muscles that I don't normally work out, so it feels great to have worked them. For dinner, my parents took my sister and I to a restaurant called Burgatory Bar in Waterworks. I had two amazing beers, Duck Rabbit Milk Stout and Great Lakes Edmund Fitzgerald Porter. They were both dark beers, which I really like. The stout had a great coffee and chocolate taste like Guinness but was much lighter. The porter was a bit more bitter, but still paired well with the delicious bison burger I got that was rubbed in coffee grinds (Kona Crust). We also ordered Gorgonzola Truffle fries, which, before the burger, were probably the best things I had to eat in all of July. Overall, a fantastic weekend even though I took a break from my training. Sometimes you just have to live life a little bit and then get back on track! Back to running TODAY!